Ended up with some extra time today, so I made a stop at the Studio to continue on the mermaid piece. However, today I left the block and tools at home (they are heavy to carry around if I don't need them) and did some experiments with color. Back in June, as I was preparing for my first Belmar woodcut class in a few years, I checked out my storage container there in Belmar and discovered a nice assortment of water soluble relief ink. A variety of colors, plus black. I knew I had a supply somewhere, but looked in vain when I was preparing for classes in 2D and Intro last year. Found it too late for college classes last year, but it was available for my summer woodcut class in Belmar this year, where some of my students paired it with colored papers from my supply of that stuff. I expect to be doing some print projects with my college classes this fall, so some of it will get used there. As of now I don't plan to make any traditional prints of my new mermaid block, but I can see taking some of my old rubbing style prints from it (for possible future use in some project) before I turn it in. And once we decided to make it a color piece of sculpture, I realized that this ink would be the ideal material to use to color it. It cleans up with water, can be applied with brush or brayer, comes in variety of colors, and is designed to sit on wooden surfaces...and I happen to have a bunch of it. At least for now, as none of these are being manufactured any more. 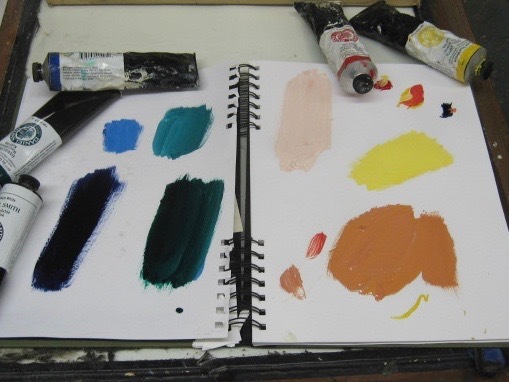 Today I was working out my palette. I knew that I needed a skin tone, hair color, tail color, starfishes, and shells. For materials I had the following colors to work with: white, black, blue, green, red, yellow. Piece of cake. I squeezed out a little of each ink onto some sketchbook paper, then used a paint brush to play with mixes. I think these will work, but not until I finish all the planned sanding left on the block. With school coming soon, it's time to get going on finishing this mermaid piece. 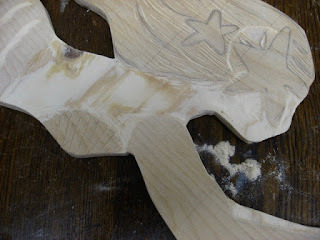 As I said last time, the cutting is pretty much done for this piece, so sanding is the next step. I dug through some of my other bags of woodcut materials and found a variety of sandpapers, made from different materials. None of the packages state what the grits are made from. I chose a 120 grit sandpaper to work with today- listed as a medium grade, suitable for leveling wood. I also had rougher and finer grits, but this seemed like a good place to start. Mostly working on bare skin today, areas of torso and face, but also some on the arms and hands. Plus sanded the edges all the way around, smoothing them a little more. Color will do more to help build space and form, but smoothing the broad areas of skin is a good thing. I suppose I could do this sanding at home, but as the photo shows it does create a little bit of fine dust, and why would I want to deal with that in my apartment? Time spent sanding gave me some time to think about the color choices, but I'll save those final decisions until after the sanding is completed. A lot of being an artist is taking care of the little tasks that have to be done. Dealt with a few such things today. Since my last posting I solved the mystery of what happened to my piece in Ocean Grove. When I went to the account I use to e-mail the building, I found I had an e-mail waiting for me with the explanation. As had been suggested, due to construction in that hallway they took those works down a few weeks early, and they should be in storage up on the 3rd floor. Since I couldn't be back during the day for the rest of the week (work conflicts), I asked if I could pick it up on Saturday, and a reply e-mail the next day told me who to see and when. And with today being Saturday... I got there in the noon hour, found my contact, we took the elevator up to the 3rd floor and he gave me my framed piece. Took it right to my car. On my way home I stopped in Belmar. 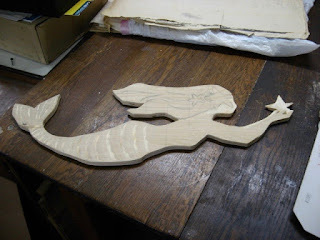 I had concluded that the most logical way to color my mermaid piece would be to use relief ink, since I have many colors and it is designed to be on wood. Don't need it yet (more sanding to come), but Saturday is the one day that I don't work and that they are open, so I decided to get it today. Just took the whole tote bag of water based color inks with me. Later I will decide which colors I need for this project and return the rest to my storage bin at the BAC. Recently had an unusual dream. Odd dreams and nightmares are pretty normal for me- it goes along with the artist thing. Sometimes I can even put them to use. Probably not it this case, but it relates in a way. In the dream I'm in my parents' car, a family road trip to somewhere. Along the way we stop at tourist attraction of some kind. It's an old very large house that has been converted to a museum, no longer set up like a home, but the interior opened up to create a large central space. No normal household furniture, but lots of museum style display cases around the perimeter of the room. Lights were very dim, making it difficult to see things on display or to read the posted information. But the thing I noticed the most was that spaces between cases, angles in walls, etc were filled with cigar store indians. No wall labels explained why they were there. In my youth such things were still sometimes around. Not so common these days. For those not familiar, these were usually standing wooden figures, carved fully in the round, generally shown clutching a handful of cigars. They were made to look like Native Americans, or at least what many people expected them to look like, sometimes just with stereotypical facial figures, but also with clothing, and sometimes with depictions of feathered headdresses. The statues could be monochromatic carved wood, or hand painted to be more decorative and noticeable. (the ones in my dream were all very dark wood) Generally carved in a naturalistic style- some quite realistic, some more cartoonish. Some quick research tells me that such things were originally deployed to make clear the locations of shops that sold tobacco products (like a striped barber pole), but they are far more rare these days. Partly because of changes in the tobacco industry, partly in changes to how stores advertise, and partly because some consider them to be racially offensive. An episode of the 90's show Seinfeld dealt with that last part as plot point. No longer really used to advertise tobacco, the vintage figures are more likely to be seen as folk art. So why are they in my dream? I suppose it's possible that the racial tensions stirred up by our president this past week brought them to the fore in my subconscious. but I think the most likely answer is this mermaid sculpture I've been working on. 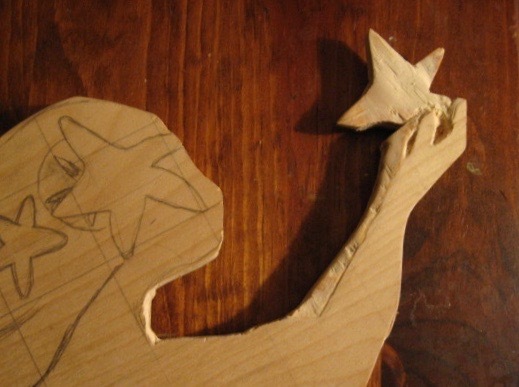 I've been carving wood since long before I was an art major, decades before making my first print. Back then I used a pocket knife, not the special gouges I have now, and my wood was usually found sticks, but I did work to represent objects in three dimensions. For the past few decades my carving has been devoted to relief, and those relief pieces being used to print images, not as objects in themselves. (I have occasionally shown those blocks, but more as a demonstration than as a final art piece) This mermaid is a very different process than what I usually do. Yesterday I stopped by my brother's house to show them the progress on the mermaid, as well as to get feedback to a few questions I had for the person who commissioned it. Although Karen had originally said she was fine with just natural wood coloring, I explained why I feel that some color would clarify the shapes better and she agreed. I also proposed putting some kind of top on the mermaid, thinking some might not approve of a bare breasted mermaid hanging on her daughter's wall. She agreed, and approved my idea of a sea shell. So I used my Tuesday Studio visit to get back to work. I started by drawing the shell, going with a scallop style design. Normally I'm a black line guy, but I fought that urge and showed the fluted texture of the shell by incising the lines. 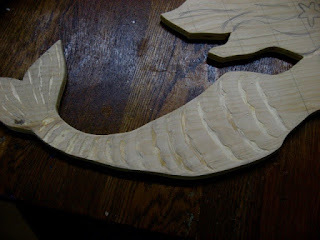 Then I took off a layer of wood from the rest of the torso, all the way to the neck. Results are shown above. 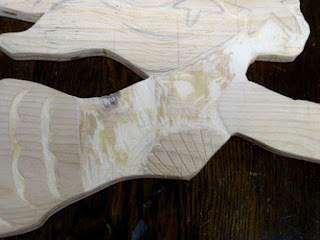 And that's probably the last of the major carving on this project. The next phase will be done with sanding, which will require better sandpaper than what I have been carrying around lately. I may have it in my woodcut supplies- if not, it's available. Color will come from water based relief inks (currently stored in my Belmar class supplies) applied with brayers, brushes, or whatever make sense as I work it out. On my way out, I stopped on the first floor to use the restroom and noticed that my contribution to the current show in the studio building was no longer hanging on wall where it was. All the art that had been in that hall was missing. So I asked what happened. If they had decided to take down the show a few weeks ahead of schedule, fine, and if they are done with it I can take my piece home. The one person I found said that pieces were moved to protect them from construction going on, but my piece may have been relocated to another floor. Also fine, as long as I eventually learn where it is. I've been advised to inquire by e-mail. Saturday is generally a good day to work on art, so following a bunch of other errands, I made my way up to Ocean Grove with my mermaid block and my tools. Today I took on the mermaid's head, my sketch based on the design I was given. 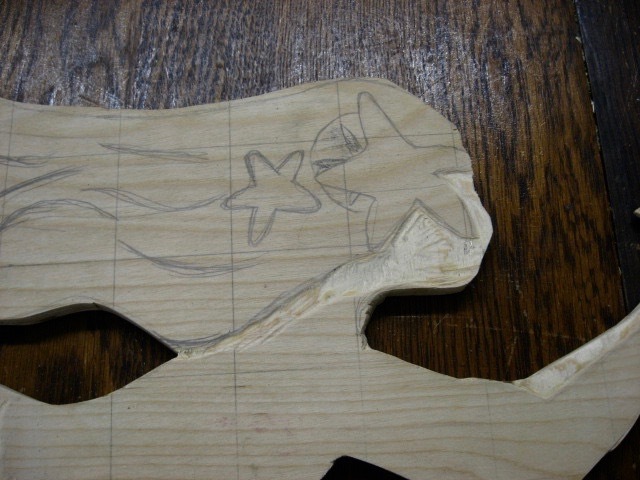 This is the second area of the figure that has multiple layers, with one small section including skin, hair, a giant sand dollar, and a giant starfish, all one on top of the other. I thought I had an idea of how to handle it, so I set up at my Studio work table and went to it. Below is a photo of today's labor. Not enough shadows to make clear exactly what all the cutting means, so I did a quick pencil rubbing to make it easier to understand. The various object shapes are definitely more visible. 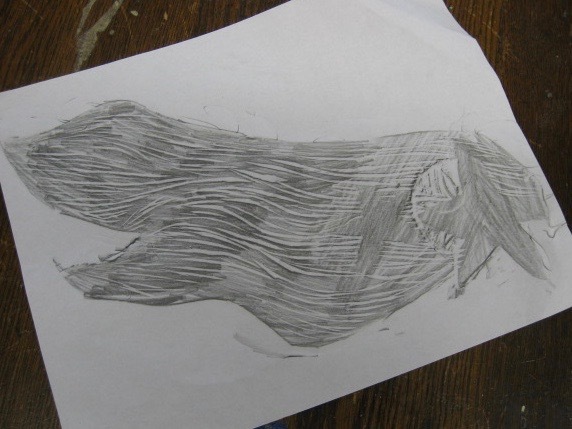 The value of the pencil rubbing is not exactly what is likely to be seen in the final version. I continue to think that color would clarify everything a bit more, so I need to see if the person who commissioned it agrees, and then figure the best way to accomplish it. And the area will need more detail cutting and shaping. but progress is good. Spent about an hour doing this today. Pushed through a lot of traffic coming through Belmar (sunny summer Saturdays are brutal at the Jersey Shore), stopped at a local supermarket to pick up a few things, and noticed that my watch was missing. Had it on when I left the Studio. About a month ago the watchband just gave up one day, the watch dropping to the ground as I was leaving a training. The next day I bought a new watch strap, but with those little pins and such replacing can be an ordeal, so once I had replaced the broken side (buckle half) I decided to stop there and let the original other half continue to do the job. My guess was that today the other side had given up. Unfortunately, no sign of the strap there in my car, so after making my food purchases, back up to Ocean Grove. Had some good luck in that the watch was in the first place I looked- on the ground, just under the passenger side of the car that took my space, and the wheels had not rolled over it, so it was intact and working. Put it in my pocket and headed home, but this extra detour cost me a half hour or so. Later in the evening I replaced the half that broke today, using the half I hadn't used last month. In recent weeks I had fallen into a pattern of working in the Studio on weekends and Mondays, and mowing the lawn on Tuesdays. However, I wasn't able to get to the Studio for the past few days, and we've had a light but persistent rain hanging around all day. So no mowing, but a trip to the Studio today. The focus today was on the mermaid's tail. I had sketched on some scale shapes a while ago and had time to think about the plan. In the prototype I had been shown, the scales were depicted with incised lines, but I decided to take a more three dimensional approach. So I outlined around the ends of the scales, removing the layer, with plans to eventually smooth the transition from scales to the empty spaces around them. Since the tail stuff didn't take that long, I decided to keep working a little while and start on the mermaid's head. My plan for this was to (for now) keep the hair and items on her head at the highest level, while removing some of he layer around those to create some range of depth. Will need to be a lot more work on this part, but this photo should give an idea of where I'm going. Below, a view of the progress on the whole thing as of today. Mondays are usually a good day to work on art. My current schedule has no other job conflicts that day, plus it was a rainy day today, so not much shore traffic. 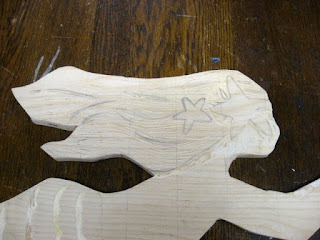 So in the afternoon I grabbed the mermaid block, and my cutting tools, and headed up to the Studio. I also made sure to bring my sharpening stone with me today, as I found some of these tools to be in need of sharpening last time. My stone is a water stone, needing to be soaked in water before it's used, and I wondered if I'd have to go to another part of the building to get some water, since the sink in our space has been out of order since May. As I approached our sink I noticed a small puddle on the floor nearby, which made me think the sink had been used recently. Turned the faucet and it worked, so filled my container and dropped my stone in there to let it get soaked. Took care of some other building business while it was getting ready. Two main reasons for doing this. First, noticed last week that these tools could use some sharpening, and best to get that done before starting the carving of this image. Second, may need to do more teaching in the near future. College starts up in about a month, and right now I am scheduled to have a 2D class at one of my schools, and I always do a woodcut project as part of my 2D class. Nothing is less guaranteed than an adjunct teaching schedule, but I should be prepared. And this past weekend I had stopped by the Boatworks seeking information and ran into the next intake, a dog themed show (I'm not submitting.) I was asked about the possibility of another woodcut class session, or even a woodcut themed show. Regarding the former I said what I always do- if there is a demand, I'm happy to run it. As for the latter- I doubt there are enough artists in the area doing woodcut to fill even one gallery, much less the whole building, and our business model requires entry fees to run shows. 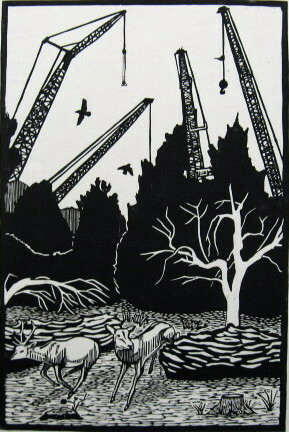 I am working hard to build interest in woodcut throughout the state, but it's a battle. Anyway, my mermaid piece. After sharpening those tools that seemed to need it, I began the process of sculpting, and I started in the most complex part of the planned object- the hands. The design (as requested by the person who asked for this) involves the mermaid swimming with arms extended out in front, holding a starfish between them. So I have at least three layers of objects in the composition- two hands (and attached arms) and the star itself. Plywood is a layered substance, which can be good, as removing a wood layer creates depth, and bad, as in you can lose whole chunks if you're not careful. About 90 minutes of work got me as far as what's shown in the above photo. It's not completely flat, and there is some implied depth to the objects, though more work is needed. In this light, shadows emphasize some of the layers of objects, but in fuller light it's not so obvious, so maybe color will be needed to clarify the subject, but that's a decision for another day. Meanwhile, knife, gouges, chisel, and sandpaper got me this far, so I assume they will see me through this whole project.